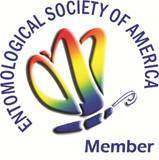 Emerald Ash Borer - AgBio, Inc.
A. Green is superior color compared to purple resulting in higher trap captures. B. No more messy glue. Easy collection of EAB. D. Fluon coating will last at least 2 years. Testing continues. E. NEW combination lure produces better attraction. Appearance: Plastic trap with the following parts: Canopy with eyebolt hanger, regular funnels, bottom funnel, collection cup with drain hole (wet collection) & plastic pins. Funnels are coated with Fluon®. Color: Green color (526nm, 47% reflectance to 530 nm, 47-57% reflectance) Material: UV Plastic. Number of funnels: 12 funnels, 8 funnels or 4 funnels. 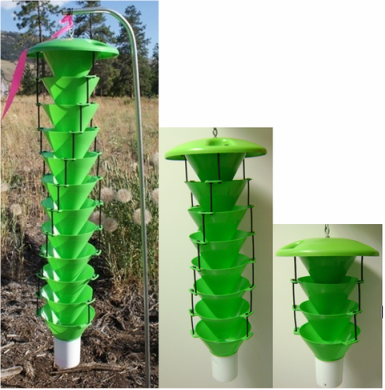 Multiple funnel traps are used for monitoring & mass trapping many species of woodborer insects including Emerald Ash Borer, Douglas fir beetle & Mountain pine beetle. Very durable trap that can be used for several seasons. Use with EAB combination lure. Traps can be hung just below the canopy of ash trees. From J.A. Francese, et. al., J. Econ Entomol. 106 (6): 2415-2423 (2013), USDA/APHIS, Table 1.